There was a time when I didn't drink wine. It's pretty surprising to me even, and I lived it, but it's true. I can't pinpoint when I became such a wine fan (it probably has a lot to do with the fact that my best friend married someone who works for a wine distributor), but it's happened and it's in full force. Fortunately for me, there have been some recent events highlighting food and wine pairings. I've been lucky enough to attend a couple of them. 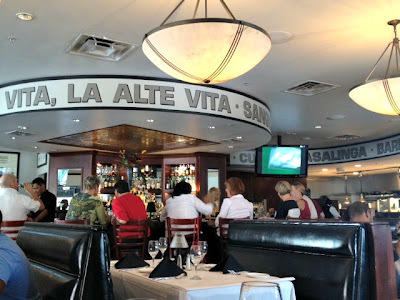 Timpano Italian Chophouse hosted myself and a couple of other Tampa foodies (including my good friend Tracy and Tampa Trib's food writer extraordinaire, Jeff Houck) to try out their new Wine & Summer Menu during a #WineDineTweet event. Timpano is one of those places I've driven by a million times, always meant to try and just never have. It's located in Hyde Park, with a fantastic area of outdoor seating, and it is always bustling. When we arrived for the event, we were seated in a half-moon booth facing the bar, which proved to be a bigger highlight of the night than one would think. Suffice it to say that we had a blast watching the bar patrons drink more...and more. Anyway, once we mingled for a little bit, we were greeted by the Restaurant Manager, Jesse Dippre. Jesse explained how the event would go, with a wine pairing for each food sampling. We were also introduced to Executive Chef Antoine Ludcene, a passionate Chef who was a pleasure to get to know. Shortly thereafter, it was time for our first course, the Artisanal Cheese & Charcuterie ($19), paired with Il Poggione Rosso di Montalcino wine. Jeff suggested the sausage, Humboldt Fog and Quince Paste on top of the ciabatta. When Jeff Houck suggests you try a combination of food, you just do. It was an amazing combination. Really, everything on the platter was enjoyable. The duck was peppery, but balanced well with the red wine, which had hints of wild berry- so good! Next, we tried the Tuscan Egg ($8), paired with Belle Glos "Meiomi" Pinot Noir. The Tuscan Egg is made with a soft boiled egg inside of crispy chicken sausage, on top of Diavolo sauce. To make the meat, Antoine covered the chicken sausage with Panko and deep fried with a combination of shallots, garlic and fresh herb. The Diavolo sauce is made with tomato sauce, heavy cream, fresh herbs and salt and pepper, topped with fresh Parmesan cheese shavings. My favorite food of the night, I pretty much scraped every last ounce of Diavolo sauce that I could get. The Tuscan Egg was a perfect combination of crispy and soft. The Meiomi is a rich wine, light to medium body, with a smooth finish and some spice on the nose. Our third mini-meal of the night was the Osso Bucco ($18) paired with Damilano "Lecinquevigne" Barolo. The Osso Bucco dish was light, yet rich. With tender pork shank, creamy Parmesan risotto and a bold pork demi-glace, this dish packed a punch of flavor. 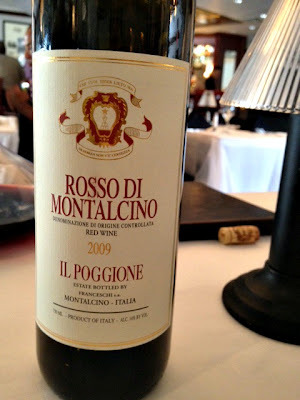 The paired wine, from the Piedmont region, had an earthy tone, with hints of black fruits and currants. The wine really was a great pairing with the red meat. Mm-mm! The following meal allowed me to try something I never had before: scallops. Unbelievable, I know. I've just never had any desire to have scallops and, in all honesty, I avoided them because the thought of eating scallops was off-putting to me, but when a restaurant is gracious enough to host you, you try everything so that's what I did. And...I was not at all disappointed! These Pan-Seared Scallops ($25), with asparagus, sweet cream polenta and with a lobster cream sauce, were out of this world. The polenta was a little too sweet for my taste when by itself, but the paired wine, Santa Margherita Pinot Grigio, helped to create a nice balance. The scallops, drizzled with the lobster sauce, created an elegant seafood dish. Recipe coming soon! Lastly, we were surprised with dessert and a paired 20 year port! The Chocolate Layer Mousse Cake was thick and creamy, not unlike a brownie interspersed with layers of mousse. The Cookies & Cream ice cream was great too. The Taylor Fladgate 20 year port was a very sippable port and made me want to relax even more into the booth at the end of the event. Thank you so much to Jesse and Antoine for making the event special! Additionally, Timpano has a host of ongoing and upcoming events- every Tuesday, stop in for Ladies Night and indulge in select martinis for $3! On Wednesdays, enjoy 1/2 off oysters at the bar! Every Saturday and Sunday, Timpano has an a la carte brunch from 11-2pm, featuring a Bloody Mary bar and unlimited mimosas for $12. Upcoming is Madonna's birthday celebration on Tuesday, August 14th at 7pm. Timpano will be the official location of the birthday party celebration with lemon drop Madonna-tinis (Madonna's favorite drink), a Material Girl shopping spree giveaway from a number of Hyde Park shops, a Madonna look alike contest and a band playing Madonna songs all night! On Friday, August 17, Timpano will play host to the Bombay Sapphire bartending event sponsored by GQ Magazine. A "blue carpet" will be laid out and the participating bartenders will create cocktails using Bombay Sapphire. They will then be judged by London mixologists. The winner will go to Las Vegas to participate in the national competition! Intrigued by Timpano? Be sure to like them on Facebook and follow them on Twitter! I need this place in my life. Now! Jenn-- you gotta bring M and me out to one of these new places when we're in town. I can't believe all the great new restaurants in Tampa these days! HAhahaha I love how Crystal knows scallops are my favorite!! TRUE STORY. I was going to comment on that saying WHAT NO SCALLOPS?! ;) Anyway, the Santa Margherita Pinot is supposed to be really good - I always see it around!! Let me imagine how a delicious your chocolate layer mousse cake. Does it use white butter cream? It's the first time for me to comment your food. I like all cakes, especially to cheese cake, but black forrest as well. Great review! That charcutterie looks amazing and is another reason I have to ge tto this place and check it out! Yum! Oh, and Meomi is one of my favorites!